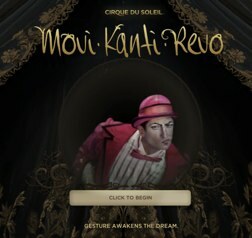 At its I/O developer conference earlier this year, Google showed off an upcoming browser-based collaboration with Cirque du Soleil that was meant to bring some of Cirque’s imagination to the browser. This experiment, Movi.Kanti.Revo, is now available online and it’s quite a trip. The experience makes full use of HTML5 and other modern web technologies and uses your webcam (or accelerometer) to track your movements as you wander through the imaginary world. As Google notes, the webcam-driven interface was “made possible using the getUserMedia feature of WebRTC, a technology supported by modern browsers that, with your permission, gives web pages access to your computer’s camera and microphone without installing any additional software.” Just like all other Chrome experiments, the Cirque du Soleil experience is based on HTML5 and also uses CSS with 3D transitions. If you are interested in the technical details, Google also just posted a case study that delves into how exactly Google, Cirque du Soleil, and the development partner Subatomic Systems created this experience. Unsurprisingly, Movi.Kanti.Revo works best in Chrome. It should also work fine in other browsers, though chances are you will have to use your mouse and not your webcam to navigate.